Double Elimination is a very popular tournament structure in Esports, despite its more intricated nature. The relationship between Winner and Loser brackets can at some point make the audience and the organizers alike scratch their heads. Who goes where, who faces who, at which stage ? So here’s our take on the right way we correlate the two brackets, especially how and where a player from the Winner Bracket ends in the Loser Bracket. This approach allows top seeds to face each other in the later stages of a tournament, if results go according to the hierarchy (higher seeding wins). Think about Tennis, where the “Big Four” members (Federer, Nadal, Djokovic, Murray) often meet around the semi-final stages. 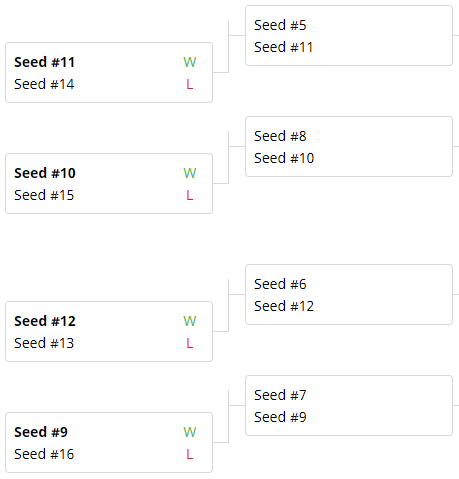 Here’s a view of a winner/single bracket, and how players are seeded. Top seeds will meet the lowest seeded opponents. Enters the Double Bracket structure, and things get a bit more complicated. A few seeding methods are being used by tournament organizers, each with a slightly different take on the matter: how is seeded the Loser Bracket ? As you can see, Rule 2 also evens the seeds differences, as opposed to the Winner’s Bracket rules. The delta value goes from 3 to 5 (8-11, 5-10, 7-12, 6-9). Here at Toornament, we thoroughly studied each popular seeding methods and listed all possible outcomes. After weighting each options, we went for the fairest one, from our view point : We follow “Rule 2″, but also respect as much as possible “Rule 1”. This leads to more variety in the matchups (Rule 2), without sacrificing the top seeds advantage, (Rule 1), while being more coherent with the way the Winner Bracket is built. 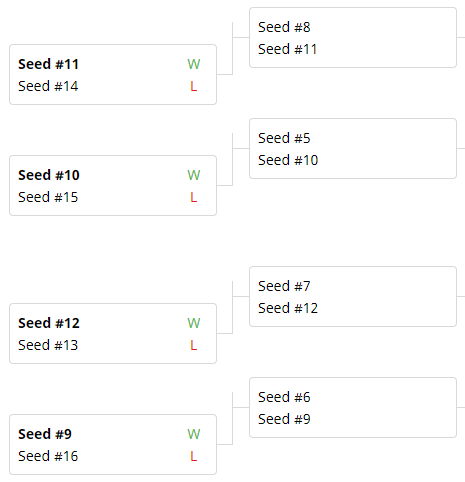 You can see here that the delta value goes from 2 to 6 (5-11, 8-10, 6-12, 7-9) and top seeds gets a better matchup, just like in the Winner Bracket. Of course, every tournament is different and each match can end in an upset. But statistically, building your Loser Bracket around the “Rule 2″ seconded by “Rule 1″ formula will provide the best seeding possible. Of course, as a tournament organizer, you can also have it your way and modify your brackets to get exactly what you want!